I have long purchased third-party plastic rolls for my FoodSaver. The quality is better (to my mind) and prices less expensive than buying the FoodSaver name brand. I have always purchased fifty foot rolls, which is fine, except that the FoodSaver only holds a roll half that size. So I have to unroll half the roll, re-roll it and cut the roll in half. No longer. 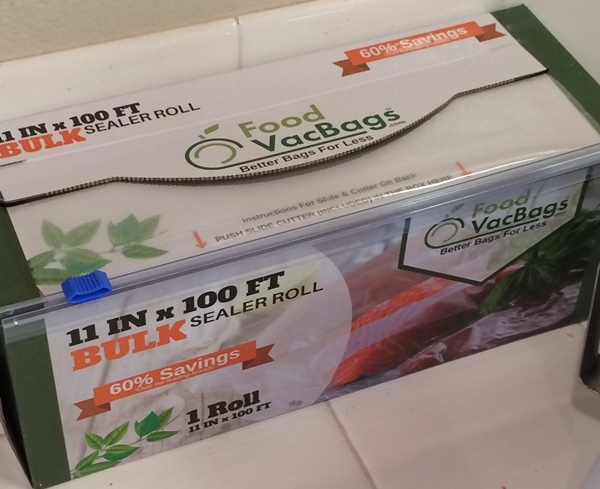 The good folks at FoodVacBags now offer a self-contained hundred foot roll in a box with its own blade unit. I put it on the counter and pull out and cut lengths as I need them.